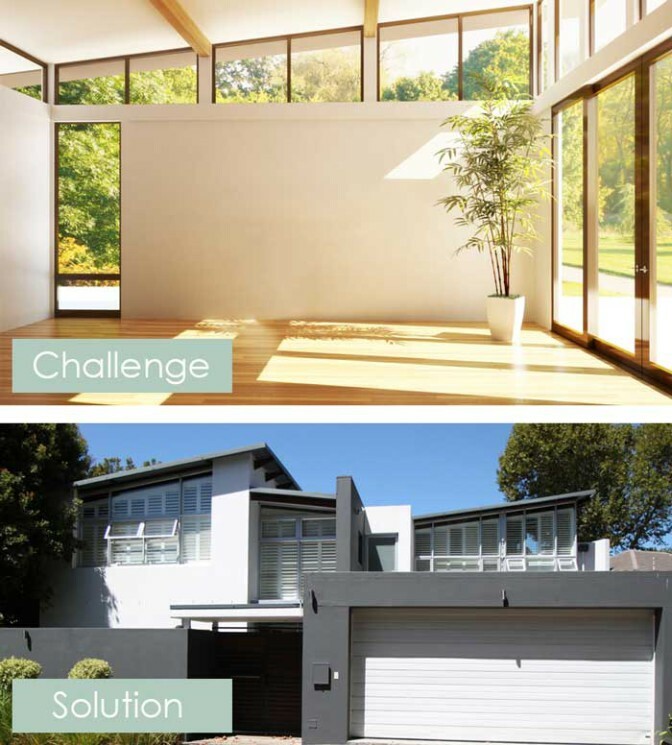 Decorating a new home can be as challenging as it is exciting. Each room needs to be individually addressed and all aspects considered to ensure that the end result is a beautiful and practical space that best serves the people who live in the home. 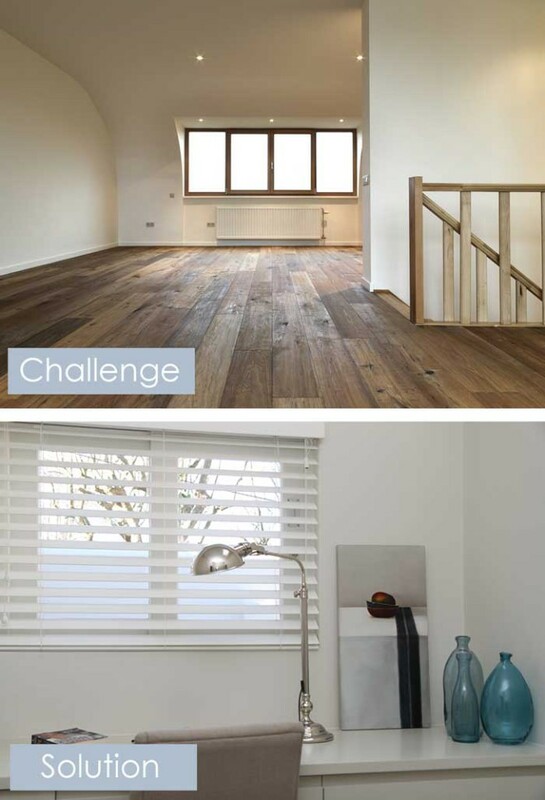 In this article we look at a few challenges, and demonstrate how shutters and or blinds are often the perfect solution. Installing shutters and blinds in a bathroom or bedroom provides absolute privacy when needed, but with a clever angle of the louvres or slats, still allows in natural light. When not in use the shutters can be opened and the blinds pulled up to maximise an attractive view. 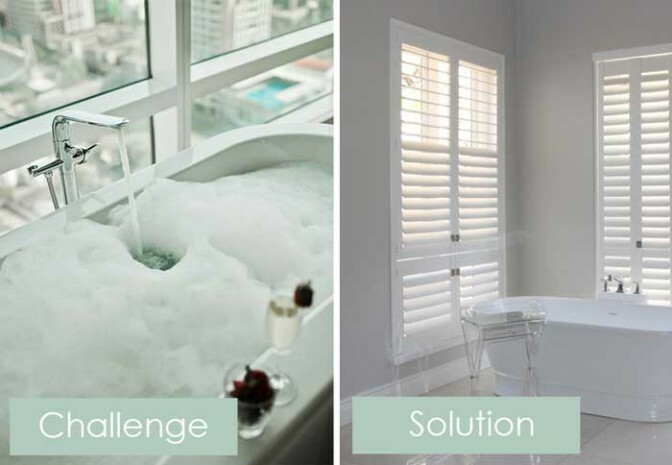 Shutters and blinds are also ideal in bathrooms, as they are practical, easy to clean, and our Woodbury range of shutters and Fauxwood blinds are water-resistant. Installing blinds in the same colour finish as the wall on which the small window is situated on, provides for a practical finish, and when closed they seamlessly merges into the background, creating an uninterrupted canvas for the room’s decor, but when opened they allow in the valuable light and ventilation provided by the window. Modern homes with large open plan living areas, loft apartments and conversions often present large spaces that need to serve a multitude of purposes; from conversation, to entertainment, to dining and work. Subdividing by building permanent walls does against the style and architecture of the home, but the need for privacy, quiet or just separation from others can demand that some sort of barrier is put up to isolate the various areas. Shutters are ideal for this purpose; by-pass or bi-fold shutters can be pulled closed with closed louvres to create complete separation, they can be pulled closed or partly closed with open louvres for separation but still facilitate easy conversation and socialising, or left open / pulled back to keep the open plan feel of the space. Unusually shaped windows or door frames are decor features in themselves, and disguising them with bulking fabric window finishes or awkwardly designed shutters is counterproductive to their style. 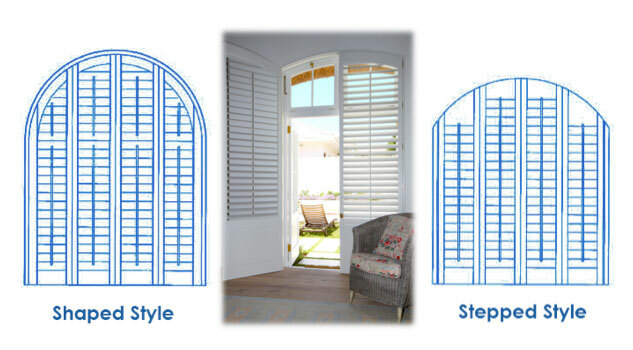 AMERICAN shutters custom-makes their shutters to enhance these features following / mirroring the shape of the arch or angle. We do not simply shape the shutter frame to fit into the recess of the arch or angle and then step the shutter top rails as some of our competitors do, which results in a jagged stepped appearance that distracts from the soft lines of the arch or angle – see the difference demonstrated below. Possibly the most appealing feature of wooden shutters other than their natural beauty, is how perfectly then enhance and frame an attractive view. 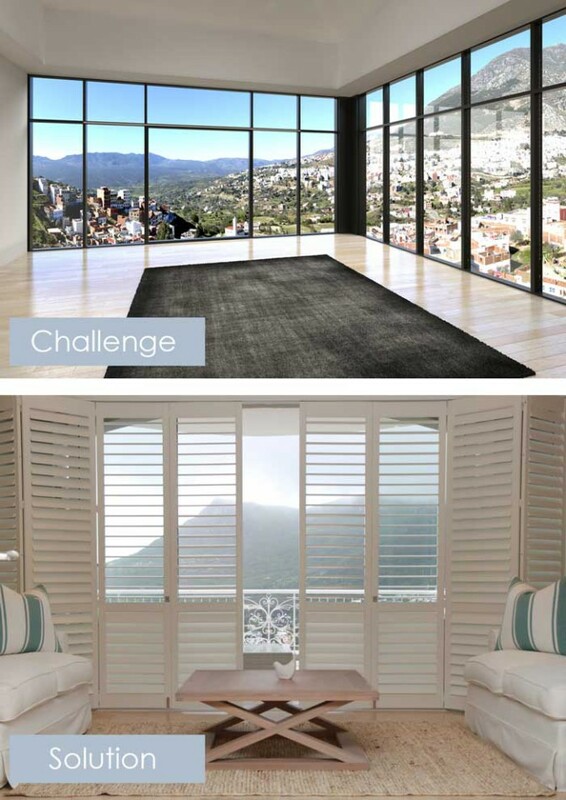 Whether it is a seascape, landscape or city-scape, shutters can easily be opened to create an uninterrupted full view of what lies beyond or closed when necessary to provide security, privacy, insulation and enhance the interior view of the home. 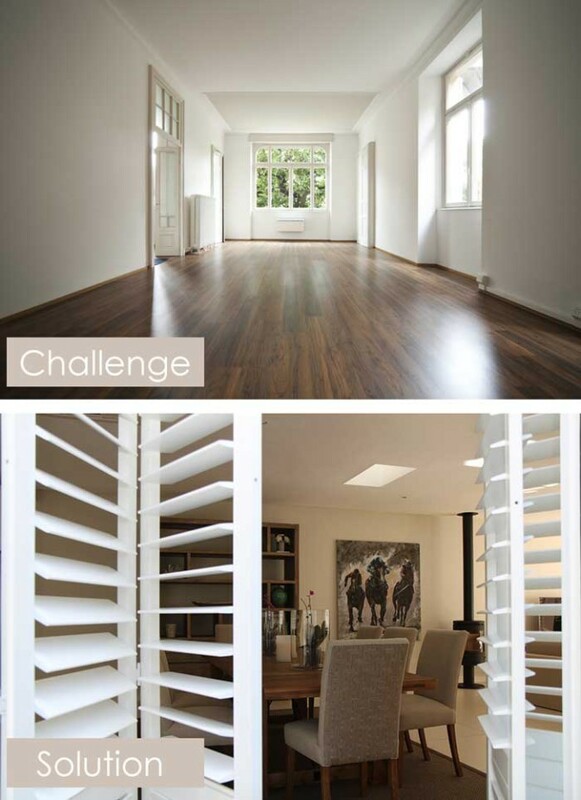 Large, small or unusual, our adjustable louvre interior and exterior shutters are up for the challenge. Bring it on!